The Los Angeles Rams and Detroit Lions both had 4-1 records and were battling for control of the NFL’s Western Conference as they faced each other on November 1, 1953. The Lions were the reigning league champions, having topped LA in a playoff to win the conference in ’52, but more recently the Rams had beaten them in Detroit two weeks earlier. 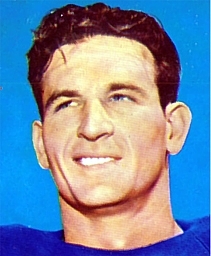 Under Head Coach Hamp Pool, Los Angeles had a high-powered offense that featured the passing of QB Norm Van Brocklin, primarily to star end Elroy “Crazylegs” Hirsch, and the running of FB “Deacon Dan” Towler and HB Skeets Quinlan (pictured above). The Lions were coached by Buddy Parker and featured a rugged defense, with the line anchored by MG Les Bingaman and the opportunistic backfield led by safety Jack Christiansen. QB Bobby Layne provided leadership as well as passing ability to the offense and the stable of backs was a good one. There was a then-record regular season crowd of 93,761 fans on hand at the Memorial Coliseum. The Lions had the opening possession and drove 78 yards in 11 plays, culminating in HB Doak Walker’s 38-yard field goal. The Rams responded by advancing into Detroit territory as Dan Towler had runs of 21 and 17 yards. But after reaching the 15, Jack Christiansen intercepted a throw by Norm Van Brocklin and ran it back 92 yards for a touchdown. Walker added the extra point and, in stunning fashion, the Lions were ahead by 10-0 midway through the opening period. In the second quarter, the Rams put together a 10-play, 58-yard series. Van Brocklin completed three passes, two to Crazylegs Hirsch, and Skeets Quinlan ran effectively, finishing the drive with a five-yard run around end for a TD. Ben Agajanian’s try for the extra point was blocked, and the score remained 10-6 in favor of the visitors. On LA’s next possession, Quinlan broke a 31-yard run to the Detroit 35, Towler carried for nine, and Van Brocklin threw to end Bob Boyd for 16 yards to set up an 18-yard field goal by Agajanian that made it a one-point game. However, HB Jug Girard took the ensuing kickoff and returned it 85 yards to the LA 15 before finally being caught from behind. Four plays later, Bobby Layne tossed a pass to end Leon Hart for a three-yard touchdown, Walker converted, and the Lions held a 17-9 lead that they took into halftime. Los Angeles struck quickly in the early minutes of third quarter when Quinlan ran around end for a spectacular 74-yard touchdown. Agajanian’s kick again made it a one-point contest at 17-16. The Lions came right back with a 65-yard advance to the LA 6. However, Walker was stopped for a seven-yard loss and Layne, heavily pressured when attempting to pass, was intercepted by safety Herb Rich, who returned it 36 yards. While Detroit immediately got the ball back when DHB Jim David picked off Quinlan’s option pass and returned it 21 yards to the Los Angeles 43, two plays later LB Don Paul intercepted a Layne throw, returned it 15 yards, and lateraled to DHB Woodley Lewis who went the remaining 45 yards for a 60-yard TD. In dramatic fashion, the Rams were ahead by 23-17. It got worse for the Lions on the next series when Layne was again picked off, and this time it was DHB Jack Dwyer returning it 31 yards for another touchdown. LA was in control by a score of 30-17. Frustrations boiled over in the fourth quarter when the Lions became enraged due to an altercation between Jim David and LA’s Bob Boyd that led to David being ejected and, when players and coaches took to the field in protest, an additional 15-yard unsportsmanlike conduct penalty. Shortly thereafter, the Rams added to their lead when Van Brocklin connected with HB Vitamin T. Smith for a 54-yard TD and Agajanian converted. The Lions scored one more time late in the game with QB Tom Dublinski spelling Layne, driving 63 yards to a one-yard touchdown carry by HB Bob “Hunchy” Hoernschemeyer, but it was of no consequence as the Rams won by a final score of 37-24. LA led in total yards (392 to 255) although the Lions had more first downs (19 to 14). The Rams ran the ball especially well, gaining 222 yards on 33 carries. Both teams turned the ball over four times apiece, with Detroit’s ultimately proving more costly. Skeets Quinlan was the rushing star with 130 yards on 12 carries that included two touchdowns. Dan Towler (pictured at left) contributed 79 yards on 14 attempts and also had two pass receptions for 21 yards. Norm Van Brocklin completed 10 of 18 passes for 153 yards and a touchdown while being intercepted twice. Crazylegs Hirsch had four catches for 51 yards while Vitamin Smith gained 63 yards on his two receptions that included a TD. For the Lions, Bobby Layne, who was harried by the LA defense, was successful on just five of 17 throws for 50 yards and a TD while giving up three interceptions. He also ran the ball for a team-leading 65 yards. In relief, Tom Dublinski was five of nine for 68 yards and was picked off once. Leon Hart topped the receivers with three catches for 29 yards and a touchdown. “The turning point came in the third quarter when our defense really put the pressure on Layne and helped us make interceptions,” explained LA's Coach Pool. The win put the Rams a game ahead of Detroit at 5-1, and seemingly in command in the Western Conference race, but they faltered, winning only one of their next four games (which included a tie). Detroit didn’t lose again and topped the conference with a 10-2 record while the Rams ended up third at 8-3-1 (the 49ers, who swept their season series with Los Angeles, placed second with a 9-3 tally). The Lions repeated as NFL Champions, defeating the Browns by a score of 17-16. Skeets Quinlan ended up rushing for 705 yards on 97 carries, for a gaudy 7.3-yard average gain, and scored four rushing touchdowns. The yardage total ranked third in the league rushing standards, while Dan Towler was second with 879 yards on 152 attempts (5.8 avg.) and seven TDs.